We are heading off round the north of the UK with our Scottish comrades Thisclose in four weeks time – Get ready. Tour flyer by Andy Morgan/Viral Age Records. 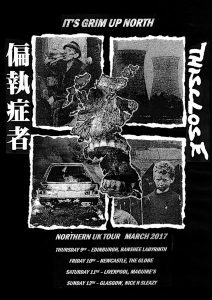 There will be tour shirts (www.thisclose86.bandcamp.com/merch/its-grim-up-north-paranoid-thisclose-2017-tour-shirt) and a limited edition of screen printed posters. Maybe we’ll bring a few more surprises. Can’t wait to hit the roads again. See you in the pit you punks!